Perhaps your child was born small and needs to move up on the growth chart or maybe she is naturally thin or recovering from an illness. Whatever the reason, it can be a struggle to help a child gain weight. Work closely with the pediatrician to ensure your child gets the nutrients she needs from a healthy diet. Babies and toddlers have unique dietary guidelines and restrictions, which you should discuss with your doctor. Children ages 2 to 18 need more dietary fat than adults. If your child needs to gain weight, consider giving him whole milk to drink with his meals. Stir in a few tablespoons of powdered milk for added calories. 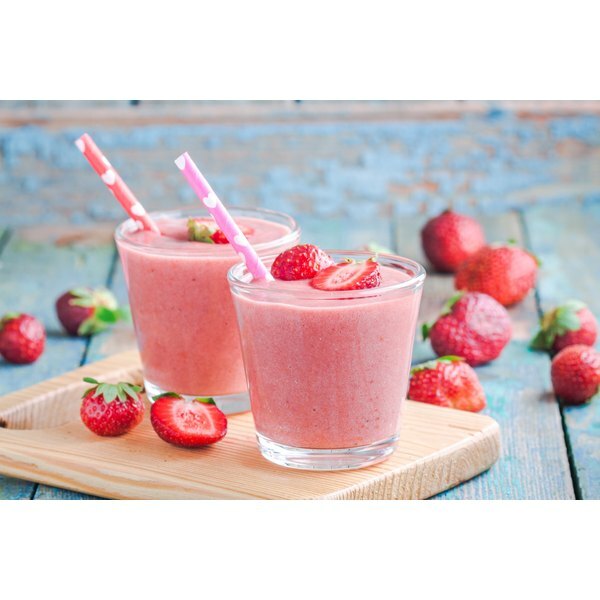 If your child doesn't like milk, whip up a smoothie with yogurt, powdered milk and fresh fruit. Blend in a fifth of an avocado. The green fruit is packed with healthy fat and will make the smoothie extra creamy. Your child may have trouble eating full meals, so make sure he always has healthy, calorie-dense snacks available. The U.C. Davis Children's Hospital recommends foods such as peanut butter, whole-grain crackers and cheese, dried fruit, nuts, yogurt, scrambled eggs and vegetables with dip. Peanut butter can pose a choking risk for young children. At mealtime, encourage your child to eat the foods that are the most calorie dense, first. These foods include meat, eggs and fish. Sneak additional calories into his meals by dressing his salads with oil, mixing dry milk powder into soups and casseroles, sprinkling cheese over his plate or drizzling olive oil over pasta and vegetables.